Prime Minister Tuilaepa Sailele Malielegaoi says Samoa’s newly established airline ensures the country will be able to determine its own destiny. 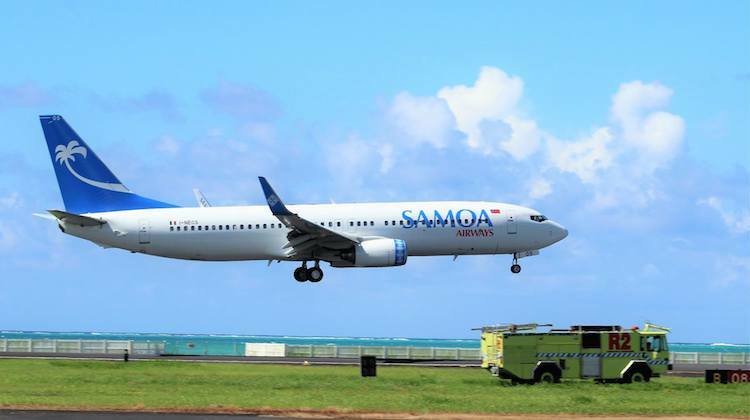 Samoa Airways’ maiden flight took off on November 14, when a leased Boeing 737-800 I-NEOS departed Apia as OL731 bound for Auckland. The airline is offering six weekly flights on the Apia-Auckland route and two flights a week between Apia and Sydney. Speaking at the formal launch of the airline at Apia’s Faleolo International Airport the day before the inaugural service, the Prime Minister said Samoa Airways was something the country should have done “a long time ago”. “Samoa can no longer rely on others to determine our destiny in terms of air travel, we can no longer sit back and let others dictate to us what’s best for our people and this country,” the Prime Minster said in a speech posted on the Samoa Government’s Facebook page. Prime Minister Tuilaepa said the government “has not given the airline any funds to start the airline”, telling Samoa Airways employees they had to “run it as a business”. “To our airline management and staff, this is the time to work as professionals, to act as professionals, to put your best foot forward, to show case Samoa and its airline to the world,” he said. The Samoa Government said on its Facebook page the aircraft, which landed in Apia on Saturday after its ferry flight from Milan via Muscat, Singapore and Cairns, was wet leased from Icelandair, with the arrangement to switch to a dry lease in six months’ time. Some 20 cabin crew were undergoing training to work on the 737. In May, the Samoa government said it would set up its own airline, with the Virgin Samoa joint venture that was established in 2005 with Virgin Australia to be terminated. Media reports at the time said the decision to ditch the JV was due to concerns over high fares. Prime Minister Tuilaepa said the decision to set up Samoa Airways was “based on sound and well researched studies”. “If you look around our region, from Vanuatu to the Solomon’s, Nauru to Kiribati and Tahiti to Fiji, our neighbours have their own national airlines and they have maintained their airlines successfully and profitably. The Prime Minister said the partnership with Fiji Airways would offer connectivity to Asia and the United States via codeshares. Samoa Airways and Air New Zealand will be the only two airlines on the Apia-Auckland route, after the Samoa Government knocked back Virgin Australia’s application to stay on the route following the end of the JV. While flights from Brisbane and Sydney to Apia launched on November 13 as previously planned, Virgin Australia was forced to cancel its five weekly Apia-Auckland service with 737-800s. The airline said it had removed the Auckland flights from sale, describing the Samoa government’s decision as “out of our control”. “We are disappointed by this decision and at this stage are working in conjunction with the Australian Government to explore options to encourage the Samoan Government to reconsider its decision,” Virgin Australia said on October 30. I lack confidence that this will be a success. Poor Pacific countries such as Samoa and Nauru will always struggle and have enough issues supporting their population, often largely on the back of aid dollars from Australia and NZ. They have no business trying to sustain a marginal airline; Nauru lost millions doing this. from one of your nations fans. I thought their 737 was leased from Neos from Italy? I wonder what other things have been going on behind the scenes between the Samoan Government and Virgin Airlines? Possibly much more to the story, because it reads like the Samoan Government were not happy with the arrangement even when it was maintaining a good standard from both NZ and Australia to Samoa? It. is true that Samoa can manage its own airline as like Air Vanuatu. Samoa working with “successful” Fiji Airways which also made its big split from a major Australasian carrier “Qantas” several years ago, is going from strength to strength. Polynesian airlines had 727, 737 and 767 at one point during their heyday with over 20 years of experience flying the bigger jets, and I am sure this time round, especially with Fiji Airways as a working partner, that they will succeed and prosper, but if they cut the deal with Virgin based on some other issues that were untoward then that’s not a good start and may be the beginning of the end already?